Sunday Quote!- Can Adam be (merely) a federal head? | J.W. Wartick -"Always Have a Reason"
Sunday Quote!- Can Adam be (merely) a federal head? Can Adam be (merely) a federal head? I found this to be an argument that could trouble those who hold to Adam as mere federal head (rather than “natural head”–here being used to mean that Adam and Eve were the first of all humans and all are descended from them), but I think a few responses would be possible from the theistic evolutionist perspective. First, one could argue that there need be no grounding in a natural reality for Adam’s federal headship. After all, divine fiat should settle the question! Second, one might instead argue that God’s decree of Adam as federal headship itself just is the ontological basis. That is, there is an ontological basis for the condemnation: God’s decree. Third, one might argue that the federal headship of Adam went alongside the giving of the human soul to Adam and Eve and that the other humans were also given souls with Adam as their federal head. I think other possibilities are possible as well. What do you think? Does this argument undermine the possibility of theistic evolutionism? Are the possible responses good rebuttals? Are there other possible responses? 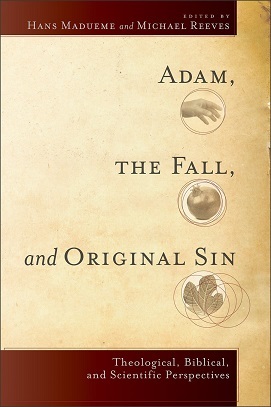 Michael Reeves and Hans Madueme, “Threads in a Seamless Garment: Original Sin in Systematic Theology” in Adam, the Fall, and Original Sin edited Hans Madueme and Michael Reeves (Grand Rapids, MI: Baker, 2014). « Really Recommended Posts 1/23/15- Creationism, Gender Jokes, and more! At last, I’ve come across scientific explanation to support the biblical narrative about a literal Adam from whom all mankind has descended. This proof debunks the un-scientific speculations about the descent of human race from a common ancestor. “The scientific case for the biblical Adam and Eve stands firm”. In my view, Adam is the federal head of all humanity, both before him and after, both those related to him and those not. I believe that before Adam, no one had ever had a connection to God. Adam was the first. This is expressed in Genesis 2 where God created Adam from dust (scientifically, it’s start dust, through abiogenesis and evolution), but it is still dust. God then breathed life into Adam, in much the way He breathes life into us when we invite Jesus into our hearts. Were not physically alive already? Of course we were and so was Adam. As a proxy for mankind, Adam became mankind’s entire connection to God. He was, federally speaking, mankind’s connection. When Adam sinned, He had missed the mark (the Jewish view of what sin is), and became separated from where God wanted Him. He became separated from God, and so in effect had mankind… all of it, reaching into the past, the future, and throughout the world. The idea of Adam’s federal headship spanning all of space and time makes him the perfect type of Christ, whose redeeming sacrifice provides the opportunity to all of mankind through all of space and time. Need we be descended from Christ? Of course not, and in my opinion, we need not be descended from Adam. This is exactly what I’m thinking. Paul’s multiple comparisons of Christ to Adam really undercut the necessity of biological connection. Just as one man’s sin was imputed to mankind *so was Christ’s righteousness imputed to us*. There doesn’t seem to be an ontological grounding for the atonement on the authour’s view. Ok. So the author’s argument is it would be unjust to punish humanity for the sins of a “merely” federal head but not unjust to impute to them the sins of a common ancestor? Huh? Let’s face it, prima facie it is unjust for God to impute to us the sins of a common ancestor. So the author needs to explain why binding us in original sin is not unjust on his model before moving on to criticise another. If the answer is divine fiat, as you point out the same argument can be used by someone who holds Adam’s headship is merely federal.